Top Chef Season 12 alum Gregory Gourdet has adhered to a “paleo-inspired” diet on and off for the last six years, becoming an expert on healthy snacking. Here he shares his recipe for ultra simple, five-ingredient gluten-free almond cookies. 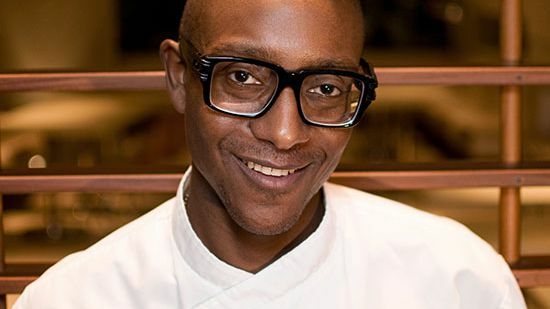 Top Chef Season 12 alum Gregory Gourdet of Departure restaurant in Portland, Oregon has adhered to a “paleo-inspired” diet on and off for the last six years, eschewing gluten and dairy as part of a healthy lifestyle that includes training for triathlons and ultra marathons. As a result, he’s become an expert on healthy snacking. He gave the Food & Wine team a quick tutorial in alternative flour: almond flour, he says, works well in tart bases and cookies; coconut flour is a dense, strong thickener, ideal in a blend, and tapioca flour is a good middle ground between dense and light. He shared his recipe for ultra simple gluten-free almond cookies, which still astonishes him: “It’s really weird. I don’t understand how this recipe works, but it does. And you can bake the cookies crispy or soft, depending on your preference.” We can't wait to give them a test drive, as we are obsessed with Gourdet's gluten-free chocolate-almond thumbprint cookies too. Combine all ingredients in a food processor and work until a smooth dough forms. Wrap dough in plastic and chill. Roll dough between two sheets of parchment paper into 1/16” thick layer. Cut or punch desired shape carefully as dough is soft. Place bottom sheet of parchment and dough on a cookie sheet and bake at 350 degrees for 7 minutes or until toasted and set. Bake up to two minutes longer for a crispier cookie.